In Norway’s ski resorts, the season is long, the conditions are good, and the slopes are so well prepared that you can have fun and feel safe no matter how old you are. If you are a family in search of child-friendly destination or a group of adults looking for resorts that are not too crowded, Norway is the place for you. 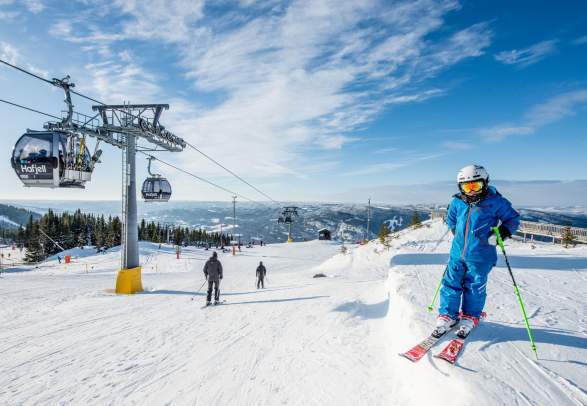 Helpful English-speaking staff, child-friendly facilities and plenty of snow characterise Norway's downhill resorts. Imagine being three years old and skiing down a hillside for the first time. What an adventure! It was at this age one of our greatest alpine heroes, Aksel Lund Svindal, took on his first full day of skiing. The feeling is something he still treasures. 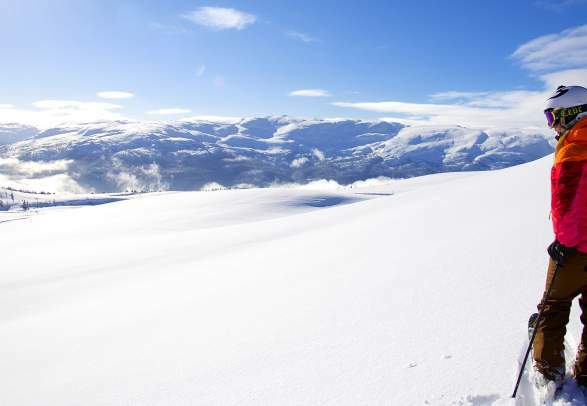 Norway is considered a skiing paradise by many, and not just because of the long season or the great snow conditions. The main reason is that there is something for everybody on offer here. Play in the children’s slopes, cruise down a red piste, or chase the perfect powder further up in the mountains – the important thing is that you have fun when you do it. 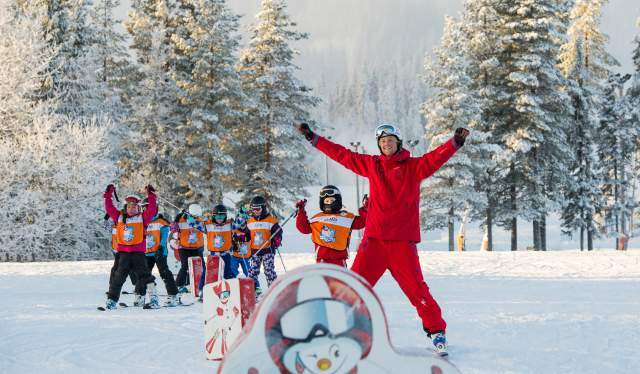 You’ll find family-friendly resorts all over the country, and most of them have ski schools and staff who are happy to teach the children to stay on their feet. Common to all facilities is that they work hard to be both safe and enjoyable at the same time. Many resorts have ski lifts literally right on your doorstep – which also means that you can ski all the way back to your room after a long day in the slopes. And after a quick change of clothes, you can lean back and relax with tasty and often local food and drinks in front of you. In Northern Norway, you can ski with large views of the sea. In Fjord Norway, you’ll find dramatic scenery with high peaks and fantastic possibilities for powder hunters. And if you want something more family-friendly than the latter, you and your children can enjoy a day of sun in a summer-open ski resort. Aksel Lund Svindal has been skiing almost everywhere. He calls it an eye-opener to have travelled around the world, only to realize that Norway has some of the most wicked conditions on earth. Aksel Lund Svindal has been skiing almost everywhere. He calls it an eye-opener to have traveled around the world, only to realize that Norway has some of the most wicked conditions on earth. Before you enter the outdoors, get familiar with the nine simple rules of the Norwegian mountain code to help you stay safe. Downhill skiing journalist and alpine authority Thomas Kleiven recommends these slopes. In Norway, snowmaking has become increasingly popular and for good reasons. With man-made snow, several resorts are now able to extend the season to late April. Did you think ski school is only for kids? Think again, there are many options for adults as well. If you thought that springtime signals the end of the skiing season, remember that there are high-altitude resorts in Norway where you can have fun on snow all summer long. However, getting an early start is essential. The glaciers can be icy at first but will soften with the first rays of sun to provide hours of good skiing. By about midday, the slopes might turn to slush – a perfect time for a cold beer, a swim and some sunbathing. Take only pictures, keep only memories. Norway is a country of outstanding natural beauty, with dramatic waterfalls, crystal clear fjords, majestic mountains, and gorgeous glaciers. Preserving this landscape, its communities, and the way of life is essential for locals and visitors alike. Whether it’s skiing in the mountains or on the trail, Norwegians try to leave as small a footprint as possible. Leave it as you would like to find it is the mantra, regardless of where you are. Get the latest update on snow conditions and weather reports from ski resorts.